The story of the Second World War told by former BBC newsreader Richard Baker, with original recordings from the BBC. From Neville Chamberlain’s historic declaration of war on Germany in 1939 to the sounds of rejoicing crowds on VJ Day in August 1945, the BBC - regarded at home and abroad as the very voice of Britain and the world’s most trusted broadcaster - brought the full picture to an attentive nation. 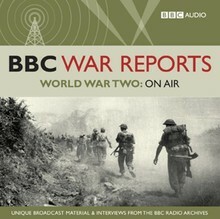 This unique chronicle of war has the same rawness and immediacy as when the recordings were first broadcast over 60 years ago. It is both a testament to the BBC War Correspondents and a rare document in history.